I visited Kuala Lumpur Bird Park one fine Sunday morning with a friend. 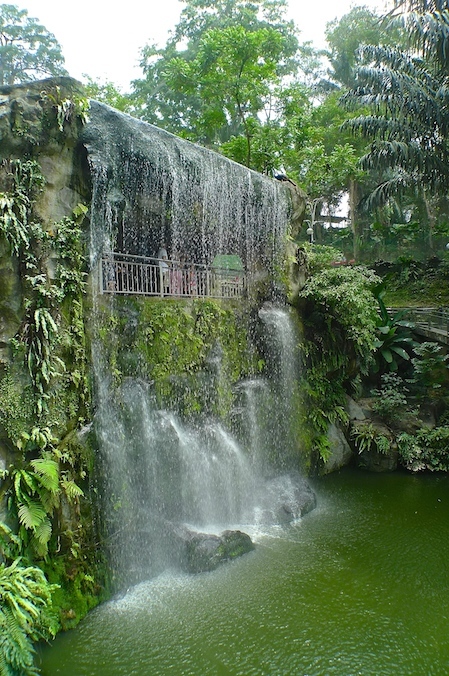 Located near KL Lake Gardens, it is one of the world's largest covered bird park. There was no parking space that day so I parked a little further away. The park is located along Jalan Cenderawasih. I did not know the road was formerly known as Jalan Spooner or Spooner Road! Since this post is more about KL Bird Park, I shall leave you to google about the historical story behind this name, if you are interested. Anyway, I drove a little further up. Passed this 'monkey crossing' sign. I think it's my first time seeing this sign. Lol. So here was where I parked my car - at the Tun Abdul Razak Memorial. Plenty of parking spaces here and it was just a short 3-minute walking distance to KL Bird Park. If you are a tourist planning to visit this park, you can get on the KL Hop-On-Hop-Off Double Decker Tour Bus which disembark at Station No. 15 right in front of KL Bird Park main entrance. The buses are available every 30 to 45 minutes interval so it's pretty convenient! A small garden outside the bird park. The welcome signboard to KL Bird Park greeted us at the entrance. My first sight of a bird. But wait..isn't that bird outside the net? So do you think it's a real bird? Lol. The Bird Park is divided into 4 zones. Zone 1 and Zone 2 make up the free-flight walk-in aviary where many species of birds fly freely and live together in an almost natural environment. The main entrance leads you into Zone 1. We passed by what is known as the Love Aviary. This is a Lovebird, which is actually a parrot. And yes, it was upside down. My first time getting up close with a pelican! Look at its long beak! It got into the water and swam. Not sure what bird this is. Is it an egret? Anyone knows? There were a lot of them at this area. A young girl seemed fascinated watching the birds. I like this blue bird with red eyes! They are crowned pigeons - one of the largest pigeon species in the world. Oh, look at those babies in the drain! A bird feeding on papaya. Some of the daily activities. Unfortunately, we missed out on all of them as we preferred to explore the park casually without worrying about the schedules. We soon reached Hornbill Park located in Zone 3. This is the Great Hornbill. At first I mistook this to be the Rhinoceros Hornbill - one of the largest hornbill species in the world. Unfortunately I did not manage to spot the Rhinoceros Hornbill that day. You will notice that Zone 3 is no longer a free-flight area, so the hornbills are in cages. Next, we were in the fowls section. This is Helmeted Guinea Fowl. The shape of this bird reminds me of a turkey. And this is Vulturine Guinea Fowl. A Great Hornbill perched on the stand. The stairs leading to the Hornbill Gift Shop. I visited this gift shop only later towards the end of our visit. The walkway with enclosures on one side. I also spotted this Purple Swamphen in the Hornbill Park. We passed by a small pond with fishes swimming inside. The pond has water-spouting tortoises. No real tortoises here, I'm afraid. Love the tropical trees surrounding the place! This is the entrance to Zone 4. Some rules to abide by when visiting this zone. The map showing where we were. Zone 1 is in green, with the red arrow showing the entrance to the Bird Park. Zone 2 is yellow (we only visited this right at the end - it looks kinda green in this photo, but it is on the right side of Zone 1). Zone 3 is in orange and Zone 4 - the largest zone - is in grey. OK these birds are not real. Haha. This is the photo booth for you to take photos with the fake birds. 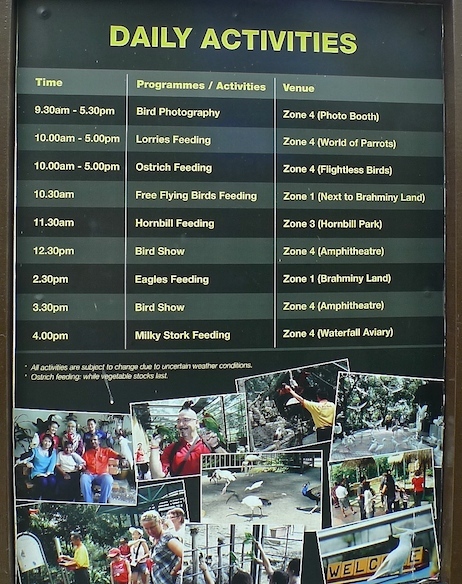 That picture of the bird above the words "KL Bird Park" - I believe that's the Rhinoceros Hornbill! I think it's KL Bird Park's logo. If I did not tell you these birds are fake, would you have thought they were real? The Parrot Kiosk where you can buy food and drinks, NOT parrots! Lol. We passed by the African Grey Parrot. Oops! Sorry out of focus! Don't worry, there will be photos of this parrot later. Check out these Blue-cheeked Amazon parrots! Look closely and you can see they have blue cheeks! Felt a bit sorry that they were in cages. We were at the World of Parrots section. I like this Palm Cockatoo! Too bad it did not speak when I was there. A pigeon in another cage. These parrots were so colourful and beautiful! This is African Grey Parrot. Not the same one as the out-of-focused parrot in the earlier photo, but it's the same specie. But it looks kind of dull after seeing those colourful parrots! Another one of those colourful parrots. I noticed they like to hang upside down. OK, not really hang, but clawing on the fence with head facing downwards. I don't know why but this African Grey Parrot looks kinda sad. Maybe it wanted to be free, not trapped in the cage. Or maybe it wanted attention and care. The same parrot in a different pose. Did you know that the African Grey Parrot is the most intelligent of all parrots? Maybe because of its intelligence, it could easily get distressed. Two parrots on a swing. 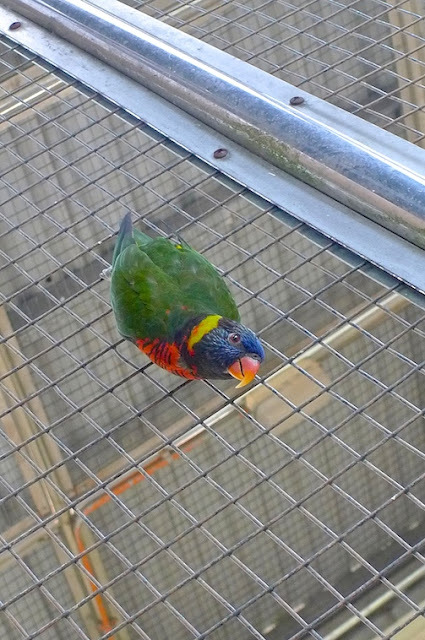 The park probably kept two birds in a cage to promote breeding. Little houses for the parrots? This is probably a Chattering Lory, with its mostly red body and green wings. A beautiful Blue-fronted Amazon parrot. Spotted a tortoise in this container. Wonder what it was doing there? Soon, we reached the Oriental Bird Aviaries. There are seats here if you want to rest. Not sure what birds these are, possibly Sun parakeets? They like to live together in a flock. A closer shot of the parakeets. This is a Red-billed Toucan. We rested for a while here before continuing to the Waterfall Aviary. Nettings covering the Waterfall Aviary. Entrance to the Waterfall Aviary. I like this part of the Bird Park. Maybe because I love waterfall! We walked towards the man-made waterfall. In fact, we went behind it. This is like a cave overlooking the lake with water falling from above. Beautiful and so relaxing! Looking down below. This is how the waterfall looks like from outside. The height of the man-made waterfall is about 30 feet tall. A closer shot of the waterfall. Can you see a bird at the top of the waterfall? Do you think it's real or fake? Lol. A few more shots of the waterfall. We had a refreshing stroll with lush greeneries around us. As this post is getting a bit too long, I better stop here. Don't miss Part 2 where we get to see many other birds like storks, ostriches, peacocks, flamingos and more!